The screenshots below are from Google Books, showing the link to the Google eBook version in the blue box to the left, and the formats available for downloading, in the upper right. The “Settings” box in the center is pasted from the Google eBook record, to show the connection between download formats and the versions available in Google eBooks. In the first example, both PDF and ePub formats available for download in Google Books. Correspondingly, in Google eBooks, Flowing text and Scanned Pages are available. 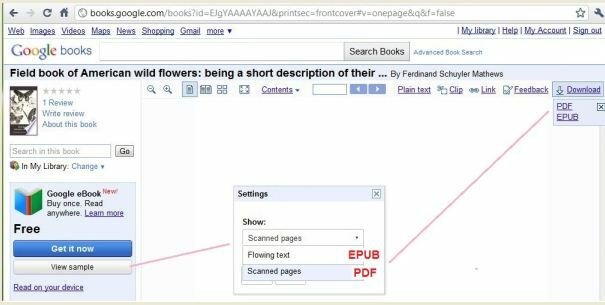 In the second example, only PDF format available for download in Google Books, and in Google eBooks, only Scanned Pages are available. Note that this is indicated in the blue box in Google Books with the note that the Google eBooks version is “Better for larger screens” (circled in red) – i.e. the PDF version is not good for mobile devices. Posted in Google Book Search, Google eBookstore, PDF, PicsYes, Uncategorized. Peter Suber, at Open Access News, has a good article on Google’s recent announcement that they are now OCR’ing scanned PDF documents so that they become searchable text documents in Google Web Search. Scroll down especially to Suber’s comments, in which he describes the background to this Google advance, which is already in Google Book Search — As he says, it’s had an OCR’d text layer version of full-view books from the start, which is how they can be searched. (Google Catalogs also has a searchable text layer). Posted in eBooks, Google Book Search, PDF, PicsNo, Uncategorized. Google recently announced that scanned PDF documents are now available in Google Web Search. PDF documents have been in Google before, but most PDF documents that have been scanned from paper documents have not, so this will greatly improve access to PDF’s. As described below, it’s important to be able to distinguish scanned PDF’s from others, of the sort that have been in Google before. Scanned PDF documents are originally created by making an image scan of a paper document, and since the text is an image, it’s not selectable or searchable as text. The other kind of PDF document, usually called native PDF, that’s been in Google before, is originally created from an existing electronic formatted document, like a Word document, and its text is selectable and searchable as text. From Google search results it’s not possible to determine whether a PDF document is a scanned document or a native document — Both simply say “File Format: PDF/Adobe Acrobat.” To see if it’s scanned or native PDF, go to the document and click on a word to see if it can be selected. If it can, it’s native PDF; if not it’s scanned PDF. It’s important to know this because in a scanned PDF, the text is not searchable within the PDF-browser reader. This is not readily apparent, because the search command seems to work, but comes up with zero results. To search the text of a scanned document, go to search results, and click “View as HTML,” which has the text of the document. Google search : Scanned PDF – Text cannot be selected (Notice that the text in this document is scratchy, poor quality, another indication of scanned text). Posted in Google, PDF, PicsNo, Uncategorized.